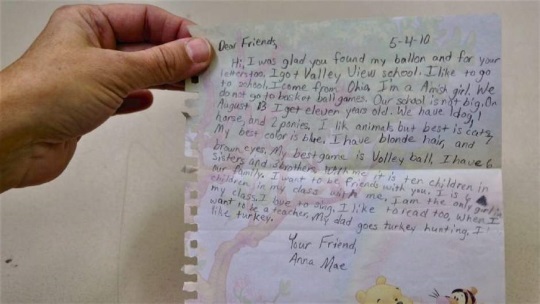 Here’s a neat story of friendship that started when a fifth-grade teacher in Pennsylvania came across a balloon released several days earlier by an Amish girl in Ohio. A deflated and tattered orange helium balloon landed in the Leechburg backyard of the Young family on April 20 of that same year. Her students were thrilled with the balloon find, and Young was thrilled with the learning opportunity for her students. Yoder wrote back to Young’s class within two weeks. Her note featured neat penmanship on Winnie-the-Pooh stationery and highlighted the fact that she was from an Amish family and was one of 10 siblings. In her letter, Yoder explained her goal of becoming a teacher, her fondness for reading, cats and eating turkey. 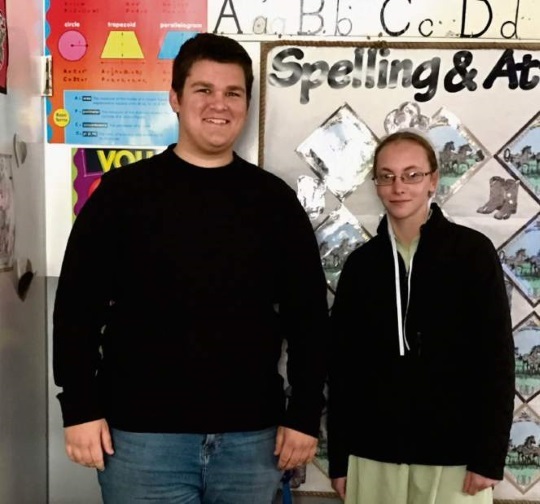 She also explained that as an Amish girl, she did not attend basketball games, one of the questions posed by Leechburg students. Later while on vacation with his family, a student of Young’s named Abe Gibson stopped by Anna Mae’s home. The Yoders welcomed Abe and his family, and now they visit annually. They have become good friends, with Abe even being invited to Anna Mae’s sister’s wedding. If you’ve ever wanted an Amish pen friend, I suppose this is one way to go about it…though the balloon release method will be more effective for Amish seeking English pen pals, than vice versa. 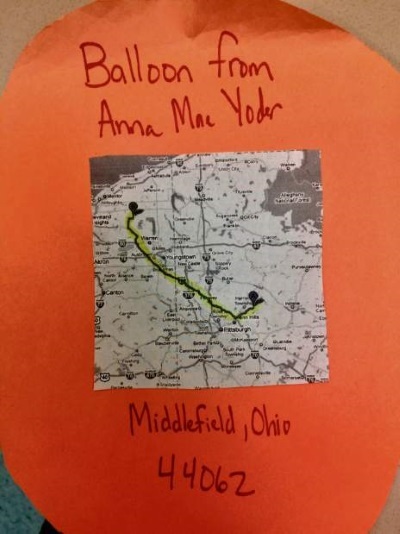 By my rough estimates using Google Maps, Anna Mae’s balloon traveled about 100 miles to reach the Leech Elementary fifth-graders. In any case, a nice tale about how special connections can come from random places. The Trib Live article also has a video on the story. Dennis Yoder is building a barn and home in Presque Isle, Maine. 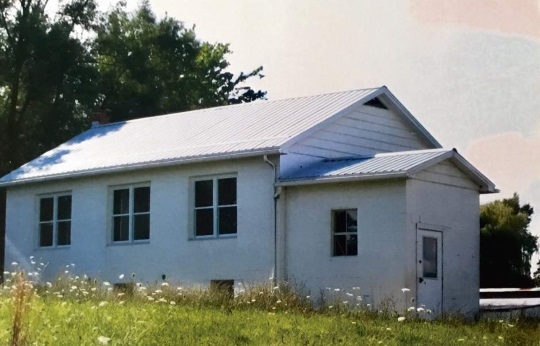 The Amishman is a nephew of Noah Yoder, who you might remember as the founder of the Fort Fairfield community in Aroostook County, ME. This article shares a nice interview with Dennis about his plans. 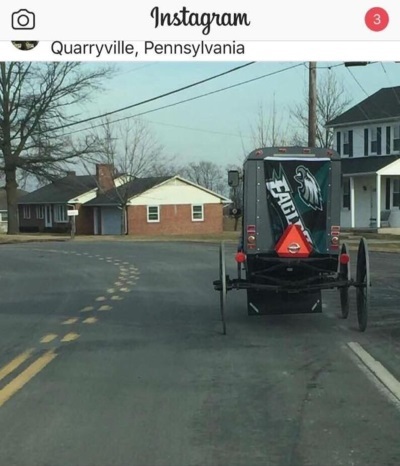 There have been 23 fatalities due to horse-and-buggy accidents in Pennsylvania since 2007. 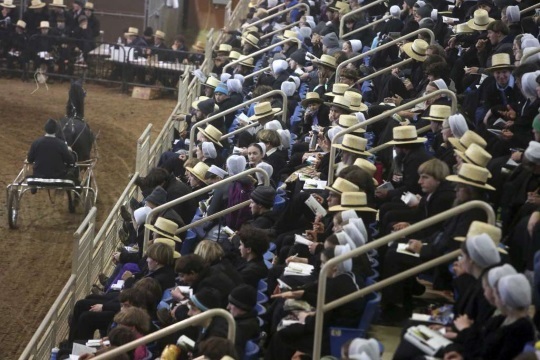 A rabbi writes about technology and faith after a visit to the Amish in PA.
What a fun post!! And how very awesome the address was able to be deciphered and the kids were able to be pen pals. I was born and raised close to the Gulf of Mexico so we would leave messages in bottles that we threw out to sea. I never heard from anyone though. How fun if I had. Glad you liked it Kim, I always enjoy these kinds of happenstance random-chance meeting stories. According to the article Anna Mae was the only one that got a response, though they release balloons all the time, but had never heard back before…though in the article it also says the children from the English school later released their own balloons and three heard back. I guess it’s not so likely to have success with this when you think about all the empty space out there where a balloon could land and go unnoticed as just a piece of trash. But this one came down in someone’s backyard, a perfect place to be found. So that makes it that much more special. I guess if you did this in a city you might have a better chance of it being found, though on the other hand, it’s probably also a factor of how long the helium inside will hold it aloft, wind, how populated the region is, and so on. Anyway, fun stuff. I once found a balloon with an address. I believe it was from New Jersey and I lived in Connecticut. I was very excited about it but I never wrote the girl whose name was on it. I don’t know why. The pic is cute. I guess she allowed a photo. Yes, some Amish are more permissive about photography than people believe, and generally speaking if they’re not church members yet (baptism occurring typically between age 18 to 22) photography is more acceptable. Photos of Amish children posing for the camera are pretty common.